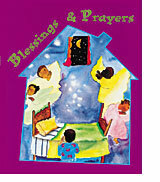 Here you'll find a colorful prayer book for toddlers and early grade-schoolers. All of the pages are adorned with wonderful, multicultural pictures with lots of details. Places are provided to write the names of people the child prays for, of those who are remembered on their birthdays and of those who have died.